Yesterday morning, I ventured out to my garden to check on a squash plant that I had recently replanted, so it has needed some extra care and attention. The leaves had been drooping, the buds small, and I have been nervous about its survival over the past week. This morning was a little different then other mornings. Yes, the plant had continued sprouting new growth, but the newer, larger leaves had been eaten off… Oh no! I quickly glanced around to realize that everything had been trimmed and eaten. Somehow, a deer (or few) must have gotten in and enjoyed everything I have been working so hard on. My strawberry plants were gone. Half eaten red and green tomatoes lay around in the dirt. My cucumber plants no longer had leaves, and the runner beans with the beautiful red flowers had been chomped down to 1/3 of their size. What can be salvaged here? This being my first season gardening, I am uncertain of what the possibility is of regrowth and survival. Then, I cried. I thought about all of the sunny mornings I had spent out here weeding, watering, pruning, and speaking to these plants as if they were my babies; so proud of them for growing so big and strong, and really looking forward to the days where I would be able to enjoy their fruits. I wept for the missing leaves, the wasted tomatoes, and for the exploitation I felt that these plants had experienced. A small sense of relief kicks in. I began to poke around, removing some damaged branches from the tomato plants, re-adjusting some cucumber stems, and suddenly I get this “ah-ha” moment. I realized that there is still life in these little green babies. They are not dead. They are very much alive. They are probably sensing my thoughts of defeat, which not the kind of example that I want to be setting for them. I watered the plants. I talked to them. 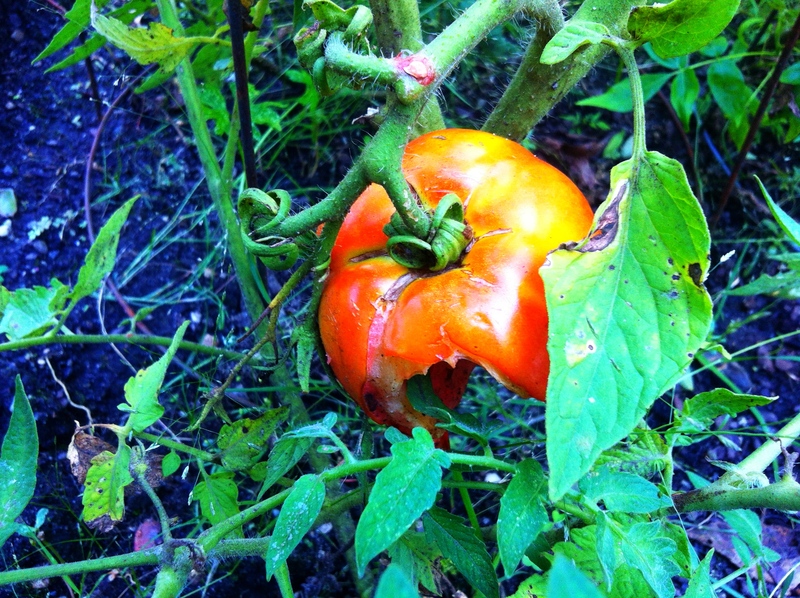 I removed all of the half-eaten tomatoes and offered them back to the earth in my compost pile. I hoped for the small, green tomatoes to grow into juicy red ones. I buried a few more bean seeds in the ground wondering if they will grow. I was beginning to trust this process. Now, sitting in my garden and looking back to that morning, I realize that we are faced with feelings of defeat and sadness all of the time, but we can’t forget about the power that we still have in these moments. This power lies in how we choose to move forward from these experiences. Of course, I am upset about my garden, but knowing that there is nothing I can do about it only empowers me to acknowledge what I can do; I can continue to care for it, to watch it grow, and take this moment as part of my first gardening experience. Moving forward, I am able to use this lesson in others areas of my life. When I begin to experience the feelings of failure or defeat, I will think of the blunt stems and bare plants that surround me at this very moment. I will know that it is all part of my journey, and I will move forward with trust and good intentions. Have you had a moment similar to this? A moment that had left you feeling defeated but you managed to overcome? Can you use that moment for facing future challenges? Tags: acceptance, empowerment, garden, growth, learn, lesson. Bookmark the permalink.